On Tuesday, in a rare bipartisan venture, in a vote of 258-159, Congress gave Mr. Trump a huge bump by allowing him to partially deliver on one of his signature campaign promises: Rolling back the Dodd-Frank Act. Now, that’s an act that was put in place to protect us from another financial collapse of the kind experienced in the Great Recession of 2008. Just after we, the taxpayer, bailed out the big banks and Wall Street, and they were just a tad more inclined to be regulated. One feature of the Dodd-Frank Act that is still in place is that recently companies began reporting pay ratios between their CEOs and the median wage earner in their company. Now, this data was compiled by staff of the Rep. Keith Ellison of Minnesota in a report called “Rewarding or Hoarding: An Examination of the Pay Ratios as Revealed by Dodd-Frank.” Now, according to this report, pay ratios among the country’s largest corporations are as large as 5000:1. 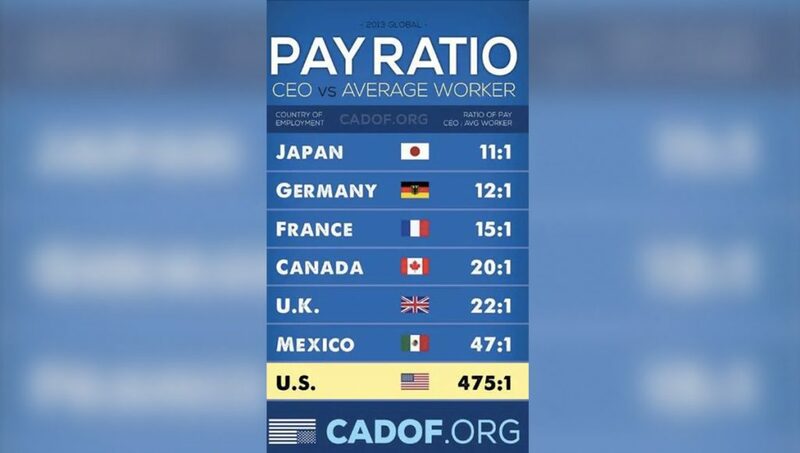 The average CEO to median wage earner ratio is 339:1. That’s the average ratio. Now, this represents a tremendous increase over 1965, when the average CEO to median wage earner ratio was only 20:1. Joining me to analyze this issue and Rep. Ellison’s recently-released report is Sarah Anderson. Sarah directs the Global Economy Project at the Institute for Policy Studies in Washington, D.C., and is co-editor of The IPS website Inequality.org. Thanks for joining us, Sarah. SARAH ANDERSON: Glad to be here. Thank you. SHARMINI PERIES: Now, Sarah, although the Dodd-Frank Act was passed eight years ago in 2010, it is only now that this data is being released, compiled, and analyzed. Why is that? SARAH ANDERSON: Yeah, it’s taken eight years for us to get this data comparing CEO pay to median worker pay, so long because corporate lobby groups had a fierce campaign to try to get rid of this part of the Dodd-Frank bill. They tried to get Republicans to repeal it in Congress, and in fact a bill to do that did pass the House, but didn’t get through the Senate. Republicans on the FCC commission tried to stall it and delay it and weaken it. In the Trump Treasury Department there was also an effort to get rid of it. But it stood because ordinary Americans and investors and others spoke out. They flooded the SEC with hundreds of thousands of letters demanding that this regulation move forward. And it was a big victory that we were able to defend this from all this attack. And so now the numbers are coming out. All U.S. publicly-held companies have to report this number to the SEC. And the results are really staggering, as a new report by Congressman Ellison’s staff shows. The highest ratio we’ve seen so far is 5000:1 at Mattel, the company that makes Barbie dolls. So in other words, the CEO of that company makes almost 5000 times as much in a year as their typical worker makes. And the average that Congressman Ellison found is about 339:1 among big U.S. companies. 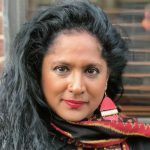 SHARMINI PERIES: Now, Sarah, for a long time it’s been generally known that inequality ratios were out of control, and that the gap between those who are very rich and those who are poor have been steadily increasing, widening, since the ’70s. And also we’ve known that since the ’70s wages haven’t increased very much for the working classes. It’s been almost at a standstill. So what does this report tell us that’s new, that we didn’t already know? SARAH ANDERSON: What we’re finding out now is what are the gaps within specific companies? So we’ve always known that the gap between CEO and average worker pay was large, but now we get to see which specific companies are doing the most to, to add to our extreme levels of inequality in this country. Which companies are sharing the wealth within the company, and which ones are just hoarding the wealth at the top through CEO pay. And what I’m particularly excited about is not just that we’re getting this new information. It’s all the ways that people can use this information to build on this, and put real teeth into these kinds of reform. So, I had the pleasure being very involved in an effort in Portland, Oregon in 2016, where they passed the world’s first tax penalty on companies that pay their CEO more than 100 times their typical worker pay. And that tax penalty on extreme CEO worker pay gaps is inforced this year in Portland. So we’ll find out at the end of the year how much money they raised from companies that do business in Portland, and that will range from Wells Fargo, because they have branches there, and Wal-Mart, because they have stores there. And other places are looking at doing the same thing. This kind of legislation to put a tax penalty on companies with extreme gaps has been introduced in six different states. San Francisco is also looking at it. And I can only think that now that the numbers are starting to roll out, which will make a tax like that quite easy to implement, that many other places will consider doing this kind of thing. SHARMINI PERIES: All right. Sarah, what are some of the other most egregious companies when it comes to these kinds of huge pay gaps between workers and CEOs? SARAH ANDERSON: Right. Well, it’s probably no surprise that Wal-Mart is right up there close to the top. Their ratio was more than 1188 times, I think, worker pay, with the CEO making about $23 million last year. And in the retail sector in general we’re seeing some of the biggest gaps, also at companies like Lowes and Home Depot. One another one that jumped out is Marathon Petroleum. They have a lot of gas stations around the country. And their ratio is also nearly 1000:1 because of the low pay for those gas station workers. We’re also learning a lot about companies’ business models and how many workers they have in other countries, because the median worker pay is based on their global workforce. So many companies are revealing that 82 percent, for example, of their employees are outside the United States. The median worker might be in Nicaragua, or China, or other places. So that’s an additional benefit of this disclosure regulation, is finding out more about the offshoring practices of so many of the big U.S. companies. SHARMINI PERIES: And Sarah, are any of the companies coming out somewhat surprised by their own data and information, and trying to correct this in any way? SARAH ANDERSON: We haven’t seen that so much yet. Congressman Ellison’s report includes some kind of almost humorous responses from some companies. The CEO of Public Storage made a particularly rich comment about comparing his pay to the pay of his workers is like comparing fruit to Star Wars, or something. You know, just what he does is so far beyond the skill level of any of the 5000 or so employees at his company that how dare you even try to put them, you know, on the same level. And so we’re eliciting a lot of responses that reveal just what a bubble these CEOs tend to live in, how totally disconnected they are from the lives of the workers, who obviously contribute a lot of value to these companies. And I think it’s revealing a huge flaw in the U.S. business model, that these gaps are not good for business. They reveal the disconnect that can undermine employee morale and productivity. And that if we had narrower gaps, a lot of research coming out of business schools shows that that companies would be more productive, that everyone would feel more like they had a stake in what’s happening at that company. So we’re, we’re seeing a debate coming out of these numbers about what is a good approach to pay practices within companies that I think is very healthy. And another outcome of this could be that consumers look at these pay ratio numbers before deciding what companies they’re going to spend their money on. You could compare companies and put your dollars towards one that has a narrower gap to try to reward that kind of behavior. We’re also looking at ways to incorporate this into contracting and subsidies policies, where maybe you shouldn’t get government subsidies and contracts if you have these extreme gaps. And we point out that we already bar [inaudible] race discrimination and inequality from getting contracts. Maybe we should also bar them if they’re contributing in an extreme way through economic inequality. Jeremy Corbyn in the UK, the head of the Labour Party there, has said that if he’s in power, companies with gaps of more than 25:1 will not qualify for government contracts. SHARMINI PERIES: All right. Sarah, now, let’s end on a positive note. What companies are having, I guess, a narrow gap when it comes to this ratio? SARAH ANDERSON: We’re still sort of sifting through the numbers to see patterns. One thing we’re going to be really interested in is to see if heavily unionized companies tend to have narrower gaps. I, I wouldn’t be surprised to see that. You see some of the utilities companies, for example, coming out with fairly narrow gaps, and they are heavily unionized. There’s also some companies that have very [inaudible] median pay levels, that it could be a reflection that they have subcontracted a lot of their lower-wage workers. So there’s going to need to be a bit more research done, I think, before we can really point to any trends of positive behavior in companies. The truth of the matter is at virtually all U.S. corporations, the gaps are much bigger than they need to be. The Ellison report shows that the vast majority of big companies have ratios that are paying CEOs more than their workers would make in an entire career of 45 years, and that a lot of experts say if you go above a 25 or 20 to 1 gap you are undermining your your business effectiveness, and of course you’re obviously contributing to really extreme economic unfairness. SHARMINI PERIES: All right. Sarah, I thank you so much for joining us today. Very interesting report, and looking forward to your other findings as you unravel them. Thank you so much. SARAH ANDERSON: Thanks a lot.